Seeing as I haven’t posted anything for exactly two weeks, I am ashamed to admit that I am a terribly unreliable blogger. I have several drafts in the works, but I haven’t felt like finishing them lately. However, all this dreadful AWOL behavior shall cease immediately because I hate feeling unproductive. To celebrate my return from the doldrums, I thought we’d talk about torture today! (Yes, Sophia is all rainbows and butterflies.) Recently, I read an interesting article in Newsweek called “The Fiction Behind Torture Policy” by Dahlia Lithwick about how the show “24” influenced US torture policy. While I am dubious about some of her claims (they’re probably a little exaggerated) , I think it’s a good example of the difference between learning from literature and confusing fiction with reality. In a nutshell, the article shows how the television show’s heroic portrayal of Jack Bauer as a man who saves the world by extracting information through torture has been cited by Bush lawyers as a defense for the torture methods employed in Guantanamo Bay and elsewhere. The examples within the article seem to suggest that the admiration for a fictional character resulted in a misplaced belief that Jack Bauer style torture was justifiable on a wider scale. U.S. interrogators rarely if ever encounter a “ticking time bomb,” someone with detailed information about an imminent terror plot. But according to the advocacy group the Parents Television Council (which has declared war on “24”), Bauer encounters a ticking time bomb an average of 12 times every season. Given that each season represents a 24-hour period, Bauer encounters someone who needs torturing 12 times per day. Experienced interrogators know that information extracted through torture is rarely reliable. 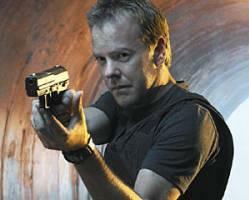 But Jack Bauer’s torture not only elicits the truth, it does so before the commercial. He is a human polygraph who has a way with flesh-eating chemicals. Even though it is often said that art is an imitation of life, I suppose sometimes people need to be reminded that an imitation or reflection is still not the same as the real thing. I remember seeing a video at the Getty Museum last May of this guy awkwardly attempting to walk while shifting all his weight from one hip to the other. This contrapposto posture in statues may appear natural and aesthetically-pleasing to the viewer, but, as the short film shows, it is still in a way forced and fabricated. I don’t think it’s fair to criticize “24” or any other show for “corrupting the youth (or government) of America.” Art, literature, and film were always meant to be a little larger than life. They’re not meant to act as a play-by-play of reality; in my opinion, the humanities can never be objective enough to serve as a perfect mirror for society and this is precisely why it is so given to multiple interpretations. Instead, the arts make us privy to its creator’s perspective upon a certain subject. Whether we support or deny the work’s message is really our own choice. In fact, it’s really our fault if we fail to think critically about what we watch or read and just passively ingest what we are told. I’ve had this big TV movie idea for awhile now and I’ve decided to pitch it to you today while progress (procrastination) continues on my movie and book reviews. Ever since the debut of Pushing Daisies (one of my new favorite shows! ), I’ve been contemplating how awesome it would be if ABC filmed a movie-length television feature that brought together all of the fabulous Broadway stars in its shows. This network has a huge treasure trove of excellent singers with Tonys, albums, and whatnot. What a waste of talent for them to just be on TV and NOT break out into song every few minutes. Grey’s Anatomy: Sara Ramirez joined Grey’s after doing Monty Python’s Spamalot, T.R. Knight (George) apparently also has some Broadway experience, and Chandra Wilson (Bailey) showed off her singing skills in a Grey’s episode where her character sings a lullaby to her baby boy over the phone. Also, Sandra Oh (Cristina) recently belted out “Like a Virgin” while doing an autopsy this season. Private Practice: I can’t vouch for any of the other actors, but Audra McDonald has won FOUR Tony Awards (three of which she won before she was 28!). Ugly Betty: Dude. Vanessa Williams. Seriously. Desperate Housewives: Sadly, none of the housewives are musically gifted, but Andrea Bowen, who plays Susan’s daughter, was part of the original cast of a Sound of Music revival as Marta von Trapp. Samantha Who? : Christina Applegate was nominated for a Tony Award for Sweet Charity. Brothers & Sisters: Both Calista Flockhart and Ron Rifkin (Saul) have Broadway experience (Rifkin won a 1998 Tony for Cabaret). Pushing Daisies: Last but not least, the jackpot. Kristin Chenoweth, whose character suffers from unrequited love with Ned, is well-known for her role as Glinda the good witch in Wicked. Swoosie Kurtz and Ellen Greene, who play Chuck’s aunts, are both Tony-winning/nominated (respectively) actresses. And all three already sing in random episodes of Pushing Daisies anyways! I’m sure I’ve missed some people who done more minor Broadway roles, but the point is there’s definitely enough people to do this musical. Evil Wilhelmina Slater opens the film with a catchy tune about her conniving plans to conquer the Meade empire. She comes to Seattle Grace hospital because Christina, her baby-surrogate, is having complications with Bradford Meade’s baby. The Grey’s Anatomy doctors need help from Addison and her Private Practice gang (as they have yet to hire a new pre-natal surgeon) so she comes up from LA for a visit. It just so happens that at the same time, Samantha Newly is getting a check-up by Derek Shepherd because her amnesia isn’t getting any better. She gets a flashback of bad Samantha being horribly mean to five housewives on Wisteria Lane and she leaves the hospital singing of her determination to make things up to them (out of hospital subplot). Former presidential candidate Robert McCallister is also at Seattle Grace with his wife Kitty Walker, who desperately hopes to conceive (the rest of the Walker clan somehow find out, call each other in that big family gossipy kind of way, and tag along, Nora asks nagging motherly questions like usual, and maybe Sarah Walker has a fling with Alex Karev). Finally, Ned, Chuck, and Emerson Cod sneak into the hospital morgue to investigate the latest murder case and Olive Snook tries to follow them to see what they’re up to (perhaps she serenades Ned from afar). It turns out the cure to everyone’s medical problems is a therapeutic trip to watch Chuck’s aunts’ synchronized swimming act the Darling Mermaid Darlings (complete with a musical performance). Ned and company tag along and catch the murder culprit at the show and the movie ends with a big happy song where Dancing with the Stars contestants join the dance sequence. What would make this movie even better would be if they did something like only sang Backstreet Boys songs the entire time. It’ll be like Scary Movie meets Mamma Mia!. But with better humor and better singing. It would blow High School Musical 3 right out of the water. To show you how well this proposal could work, the following is a clip of how musical-esque scenes are wonderfully integrated into Pushing Daisies episodes. Just imagine this video, except a lot longer and with more people. Enjoy!